In June of 2003 Simon Holland sold his 6.75 inch french fry from Culver's in Wisconsin for $200 on ebay! In July of 2006 a 9.5 inch fry was cooked up at Bobu's Steak House in Topeka, KS. 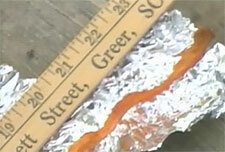 The restaurant's owner, Bob Radke, said it came out of the bag of frozen fries just that way. Radke named it the "Patriot Fry" and put it in his freezer. And here's a kid on Flickr with a giant fry. But they have NOTHING on a teen from Traveler's Rest (aka 'TR'), South Carolina. Hannah Odom went to an Arby's in Hendersonville, SC and ordered some curly fries with her meal. When she reached in to eat one of the curly fries, she couldn't get it out of the package. When she finally got it out it was quite lengthy. How lengthy? Almost 24 inches, yes, 2 FEET long. And that's not even stretched out all the way. Odom is hoping her french fry makes it into the Guinness Book of World Records as the world's longest french fry. She resisted both primary temptations: to eat it and to sell it on ebay. She has wrapped it in foil, put it in her fridge and contacted the Guinness Book of World Records. A 2 foot long fast food french fry! That's got to make it into Guinness.